The genus name came from Greek ‘hyper’ meaning above and ‘eikon’ meaning picture or image  a reference to an old practice of placing St. John’s Wort flowers above religious images to avoid evil doings. The genus Hypericum consists of around 400 species worldwide and nearly 30 species in North America, all simply referred to as St. John’s wort. This species is named ‘perforatum’ due to its perforated look caused by minute oil glands on the underside of the leaves. Along the edges of its five petals are black bumps that are actually glands that contain essential oil. Other common names include common St. John's wort, perforate St. John's wort, God’s wonder plant, witches herb, amber, klamath weed, tipton weed and goatweed. The sunny-colored Hypericum perforatum is a type of hardy and perennial herb that is indigenous to Europe, West Asia and North Africa and is so widespread all over the world including North America. The Ancient Greeks and the Native Americans have been using this dainty herb both topically and orally in treating sciatica, snake bites, burns, bruises, wounds, fever and diarrhea. The Europeans believe in its calming and soothing effects to the mind besides using the herb to treat concussion, urinary infections, jaundice, shock, gout, catarrhs and rheumatism. 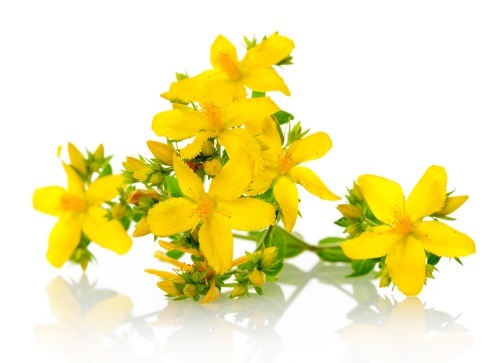 Current medical studies have proven St. John’s wort possesses calming properties that are beneficial in promoting a state of relaxation, influence good stable mood and restful sleep. Meanwhile the herb’s anti-viral properties may reduce catarrh in the respiratory system. Its anti-bacteria and anti-inflammatory properties are being utilized to make oil infusion and balm for insect bites, bruises, cuts and wounds. Hypericum perforatum can cause stomach upset, nausea, headache, sleepiness and rashes in certain people. Due to its photosensitizing properties it may induce photosensitivity to fair-skinned individuals, especially if using other photosensitizing products and under prolonged exposure to sun. Avoid the herb if undergoing or about to undergo chemotherapy, radiation therapy or surgery. Pregnant or nursing mothers must also avoid the herb.